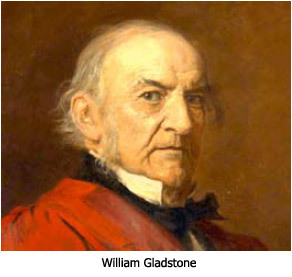 One of the greatest public servants in the history of England was William Gladstone (1809 - 1898) who served as Prime Minister four times during the latter half of the 19th Century. "What do you hope to do when you graduate from college?" Gladstone asked. The young man replied, "I hope to attend law school, sir, just as you did." "That's a noble goal," said Gladstone, "Then what?" "I hope to practice law and make a good name for myself defending the poor and the outcasts of society, just as you did." "That's a noble purpose," replied Gladstone. "Then what?" "Well, sir, I hope one day to stand for Parliament and become a servant of the people, even as you did." "That too is a noble hope. What then?" asked Gladstone. "I would hope to be able to serve in the Parliament with great distinction, evidencing integrity and a concern for justice — even as you did." "I would hope to serve the government as Prime Minister with the same vigor, dedication, vision, and integrity as you did." "And what then?" asked Gladstone. "I would hope to retire with honors and write my memoirs — even as you are presently doing — so that others could learn from my mistakes and triumphs." "All of that is very noble," said Gladstone, "and then what?" The young man thought for a moment. "Well, sir, I suppose I will then die." "That's correct," said Gladstone. "And then what?" The young man looked puzzled. "Well, sir," he answered hesitantly, "I've never given that any thought." "Young man," Gladstone responded, "the only advice I have for you is for you to go home, read your Bible, and think about eternity." Think about eternity! What good advice. Life goes by so quickly. It is like a vapor that is here one moment and evaporates the next. We are preparing for eternity. Are you ready? And now I have a word for you who brashly announce, "Today — at the latest, tomorrow — we're off to such and such a city for the year. We're going to start a business and make a lot of money.". Instead, make it a habit to say, "If the Master wills it and we're still alive, we'll do this or that." In the second part of this series on living with an eternal perspective, we will explore the fleeting nature of life. 1) Roy Jenkins, Gladstone: A Biography (New York, New York: Random House, 1997), 768 pages. 2) There are many versions of this conversation that circulate on the Internet, all making the same point. The version reproduced here is a composite prepared by the author. 3) Eugene H. Peterson, The Message (Colorado Springs, Colorado: Navpress, 2002), p. 572. "Think about eternity! What good advice. Life goes by so quickly. It is like a vapor that is here one moment and evaporates the next." It may seem like life goes by quickly but not quickly enough! I want the Rapture to come and it can't come soon enough! Every day that passes without it seems like an eternity to me. Life is crawling because I want outta here! There probably a lot of things wrong about what I said and if when I think about it later I'll regret it but that how I'm feeling this morning anyway. Me: Yep, those 2 day go by so fast. So a couple minutes after complaining about days crawling I'm saying how fast the weekend days flew bay. Thank you for serving the Lord, David. Eternal perspective is extremely important, especially in these days. Maranatha! I don't read or see that at all. Anonymous why are you anonymous, and stating that you read someone's else's opinion about Dr. Reagan who's dangerous according to what you've read by someone else. I have read some of Dr. Reagan material for some years and it definitely lines up with the Word of God; and i became a prophesy partner. Interesting how a faithful man of God is being subjected to being called dangerous and sinking into the emergent mire. He's been along for a while and knows his stuff. His raft will inflate out there because his writings are based on the Word. I wonder where the rich man is today that reported back from Hell? Hasn't he been in hell long enough to be punished for what he did? Has the drop of water been delivered as requested? Jesus cleared up the hell question long time ago! Please do NOT be deceived by moderrn men's wisdom!! Man's wisdom will never surpass God's!! !